What Happens when calories become currency? What happens when bio-terrorism becomes a tool for corporate profits, when said bio-terrorism’s genetic drift forces mankind to the cusp of post-human evolution? 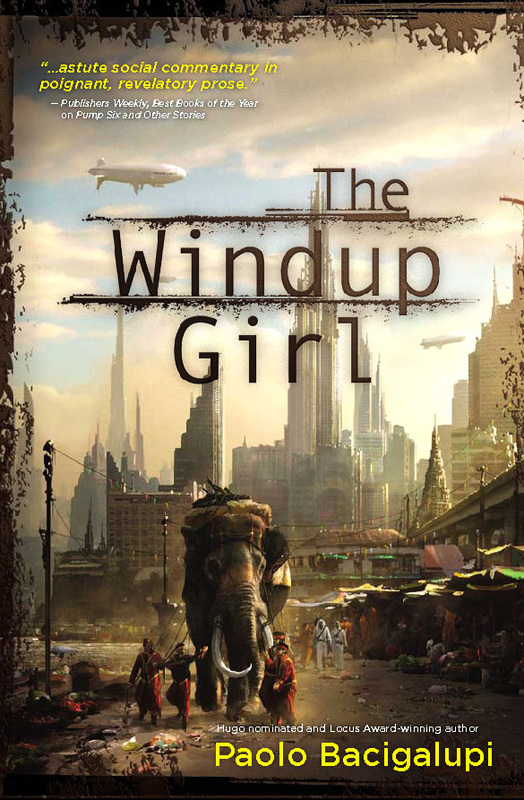 In The Windup Girl, award-winning author Paolo Bacigalupi returns to the world of “The Calorie Man” ( Theodore Sturgeon Memorial Award-winner, Hugo Award nominee, 2006) and “Yellow Card Man” (Hugo Award nominee, 2007) in order to address these poignant questions. I recently got a large stack of books from Night Shade books, but this one was not among them. John Ottinger over at Grasping for the Wind called it “good, if depressing, fiction.” This is one case where the title hooks me more than the blurb. If I saw this on the shelf, I’d be tempted to buy it on the strength of the title alone. However, I’m not sure I get the premise, because it mentions things like calorie companies without giving any clue as to what that is, and how bio-terrorism can possibly bring about corporate profits. John Scalzi has a Big Idea post on it. It does sound an interesting read because of the concept. I’ve gotten wary. These days I always try to read an excerpt before I commit to a book. I read this book and really enjoyed it. But then I was already a fan of Bacigalupi from reading his collection, Pump Six. Good but depressing, eh? I do like a good dystopia. The cover looks vaguely steampunk-ish. Shall look out for it, thanks for the review! This is definitely steampunk. Thanks for chiming in, Benjamin! I have Pump Six in e-book form, but right now it’s difficult for me to read ebooks. An Ipod Touch is on my Christmas list, though! I shall feel like a child again!